Two Opportunities You Need To Know About The Markets Happening Right Now! There are 2 interesting things happening in the markets right now, one is in Oil and the other is in the large divergence between US equities and bond yields. Let’s take a look at Oil first. 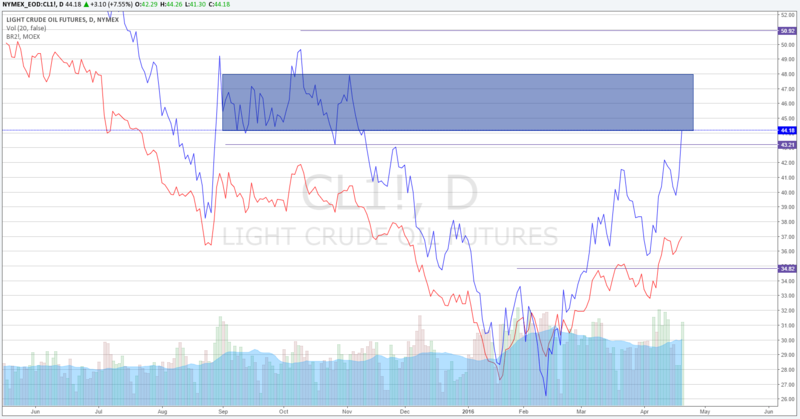 Price has been steadily moving higher since my last post on Light Crude Oil here. In that post, I highlighted a bullish divergence. We had the Doha talks over the weekend, where the oil-producing nations tried to come to an agreement on freezing production levels in a bid to stage a proper recovery in oil prices. There was a lot of optimism going into the talks but in the end, there was no deal. Seems like for now, all countries are going to just produce for self-interest until something changes. The larger oil producing countries like Iran and Saudi Arabia, are even ready to increase their production of oil. However, the less wealthy countries have problems supporting their current levels of production at current prices of oil. These countries tend to have oil accounting for a very significant part of their economy. However, they lack funds to further invest in the energy sector, so it’s difficult for them to lower the cost of oil extraction. In my previous post I highlighted a few scenarios, all of them had bullish implications. Now that prices of Oil have floated higher, some of the scenarios have changed. At current levels, most of the countries will still profit from oil production, temporarily decreasing the need for any freeze on oil production. It is yet to be seen if oil price can hold current level into the longer term and move higher. I called $43 as an interesting level which we should react from. Price has since reached for it twice, stopping just shy of it at $42. It’s making a run for that area again right now. This will present us with some clues for the next swing in Oil. A rejection from this area would indicate $36 is on the cards again. A break through the area would bring $51 and possibly $56 into play. The chart I’ve included is a Daily chart comparison between Light Crude and Brent Crude oil prices. Light is the stronger of the two, having just done a push into the previous consolidation area. These oil producing countries don’t like low prices in oil, so they will take necessary actions to keep prices afloat. Looking at how price didn’t like staying under the $30 zone, prices should remain above that moving forward. But should the major Oil producing countries decide to increase production and supply grows a lot, we could see prices turn downwards. Here is another divergence which has been forming recently. It’s on the weekly chart of US markets, between the DJIA and Nasdaq and 10 year bond yields. Usually movements in equity markets are led by a similar move in yields. This is because investors flee to bonds whenever there is strong uncertainty in the markets. When there is uncertainty, equities tend to drop. When investors buy up bonds, bond yields will drop. 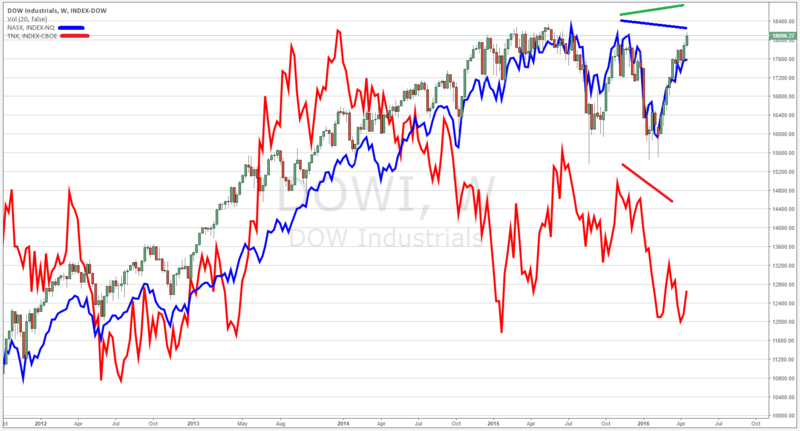 Firstly, there is a divergence in the equity markets. DJIA making higher high while the Nasdaq is making a lower high. Another divergence has developed with bond yields remaining near the lows, barely making a swing high, while the equity markets move nearer to previous swing highs. This means investors are buying up equities while also buying bonds, which seems to indicate to me as a whole they aren’t sure what to do in the markets and that translates to uncertainty. So there seems to be a bearish divergence between equity and bond yields on the weekly timeframe. This could change as we are in a time with US government policy stances could be adjusted. As a trader and investor, please do your own due diligence before committing any funds to a trade idea.